At first I was going to describe it as a wave. Then I was going to use the image of a Tsunami, a high wall of water moving onshore crushing everything in its path. But “Tsunami” would be a pejorative in this context since there won’t be any destruction, only opportunity: Massive opportunity at that. We have all heard of the Baby Boomers, since 77 million of us are Boomers and until now, we were the largest generation this country has had. The Boomers (born 1946-1964) changed everything, from where we lived to how we consumed (and man, did we consume!) 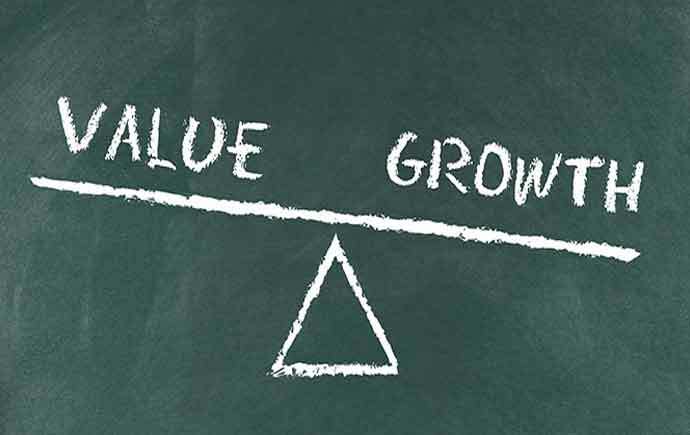 The Boomer generation set the tone as well as the pace for the American Economy since the mid 1940’s. From schools to music to travel to the size of our homes, it was all about the Boomers. The Baby Boomers largely defined the America we live in today. After the Boomers came Generation X. Gen X was relatively small compared with the Boomers, nearly 9 million fewer Americans are among the Gen X generation. 1957 was the single largest year for births in the US: Just over 4.3 million Americans were born that year. Compare that with 1973, with just over 3.1 million births. 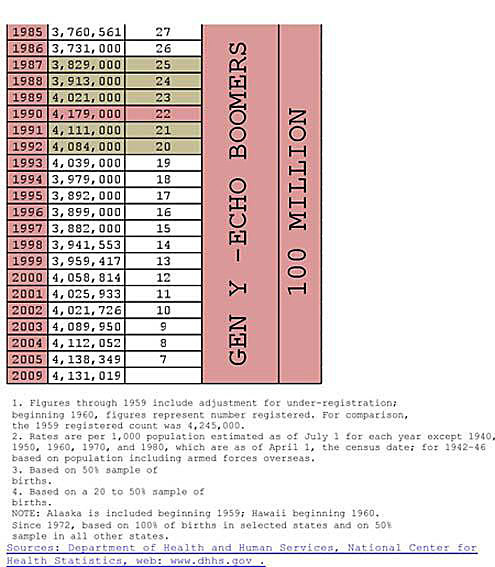 That’s more than 1 million people fewer were born when comparing 1973 to 1957. So why am I writing about that? The oldest of the Boomers are over 65 years old and are retiring. The youngest of them are 48 years old and are thinking about retirement, but still have some jewelry buying years ahead of them. 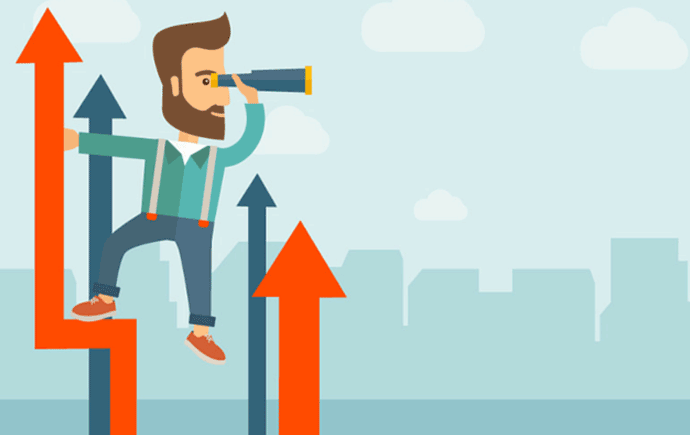 However, and this is where your marketing and merchandising strategies need to be considered, the oldest Gen Xers are approaching their late 40’s… and there are millions fewer of them! Given the significantly smaller size of their generation and the shock the economy is recovering from, we won’t see the same numbers of people coming into the store to buy those significant purchases as we did 20 years ago… they can’t.. There aren’t nearly the same numbers of them! Our opportunity as in industry lies in the Millennials (also known as Gen Y, or Echo Boomers), specifically, to begin with, in the bridal department. As you will see below, the chart shows the number of births in the US by year. I added a column showing how old they are today and separated them by generation. 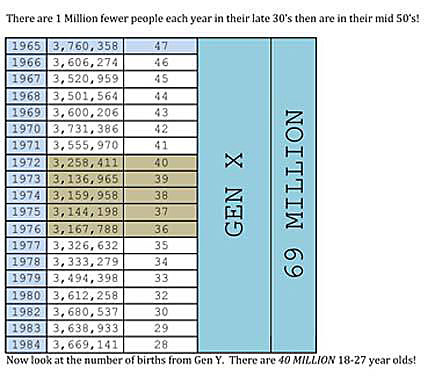 Take note of the numbers of men and women in their mid-20’s compared with those in their mid-30’s. There are a million more of them, each year! 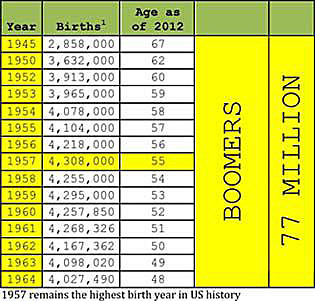 Where the Boomers were comprised of 77 million people, the Millennials will number closer to 100 million. Here’s the really exciting part – the leading edge of the Millennials are now 27 years old and the median age to marry in the US is 28.2 years for men, and 26.1 for women! There are 40 million 18-27 year olds! 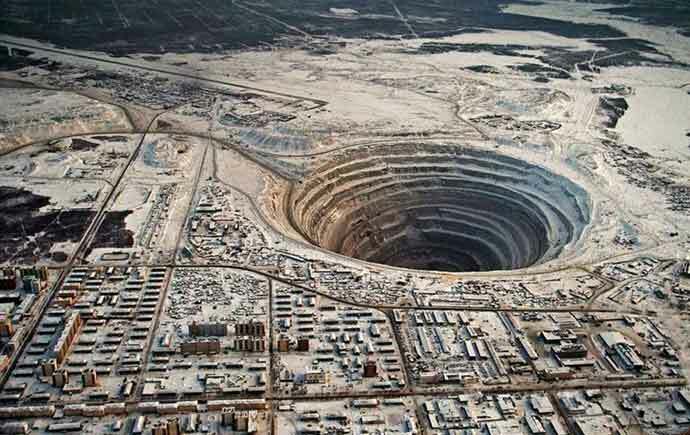 This is an enormous opportunity for jewelers. It’s beginning right now and it will be going to go on for the next two decades: The opportunity is in first time diamond buyers. You should be advertising to young people right now, using traditional ads. But you should also be present on the social media sites; Facebook and Pinterest, etc. It would behoove you to hire some 20 something’s to sell to their peers as well. Just think back to when you bought anything in a store when YOU were 25 years old and how fun that was! Most importantly, you need to carry product that fits their pocketbook, or at least, an affordable monthly payment! It’s perfectly fine to carry all of the high-end branded bridal lines as well, but this is the time to be introducing entry-level bridal to a brand new audience. This next generation of consumers is here now. They are just entering their jewelry buying years and I’d prefer that they begin by buying that jewelry from you. In the immortal words of Neil Young, In the field of opportunity it’s plowing time again. For much more on this subject, I strongly recommend you read The Age Curve by Kenneth W. Gronbach. We were assigned this book for one of our Plexus groups in the spring and it will be discussed at all of our fall Plexus meetings. It was the inspiration for this article.